JUST LET US KNOW WHAT WORKS FOR YOU! 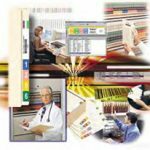 design a filing system based on your needs. Top tab or end tab manila, pressboard, kraft and colored folders can be ordered with fasteners installed in any of eight different positions. Several folders with fasteners in position no. 1 or positions no. 1 & 3 are listed as stock items. Other positions must be ordered on an MTO basis. NOTE: Metal tabs may prevent proper positioning in positions no. 2 and no. 8. Fastenrers applied in posiitons no 6 or no. 7 may affect the expansion feature of the folder. Exact placement of the fastener is based on standard letter or legal size folders. Any deviation from standard positions must be detailed on your order and will be priced and processed as an MTO item. MTO installed fasteners are available in three styles. Choose the style that best fits your needs. All metal fastener with brown enamel finish. Recessed into the folder from the outside, “2K” style fasteners provide superior strength to hold large amounts of papers. Available in 2″ capacity for 2-3/4″ center-to-center punched papers only. 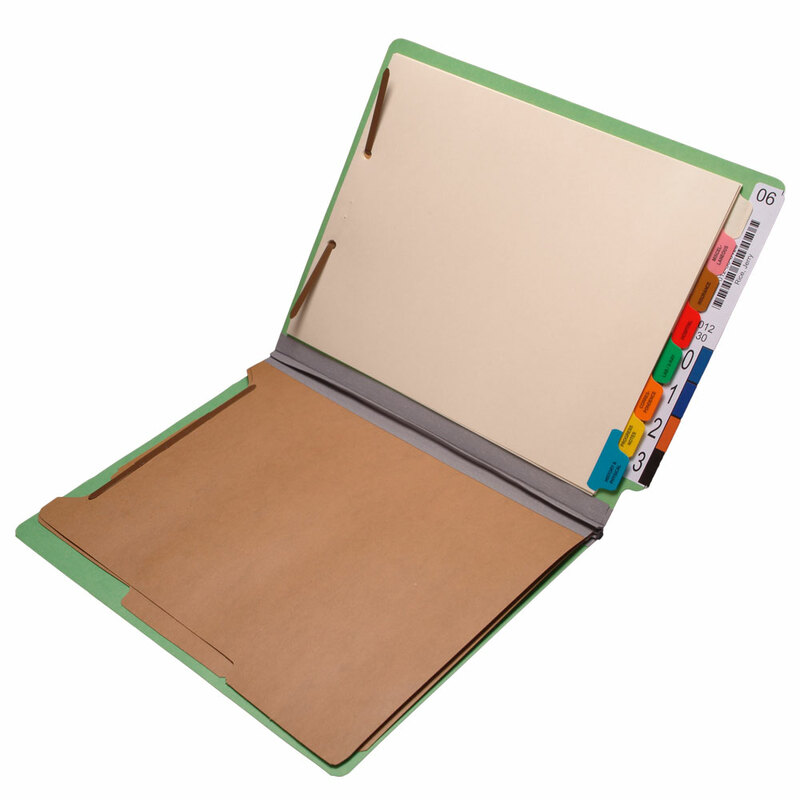 A strong fiber base bonds the brown enamel metal prongs of the fastener to the inside of folders. Fastener is not visible from the outside of the folder. Available in 2″capacity for 2-3/4″ center-to-center punched papers only. The flexible design of this fastener allows folders to function like ring binders. Self-adhesive base attaches to any folder. Available in 2″capacity for 2-3/4″ center-to-center punched papers. Twin-prong (TP) fasteners are used in dividers where a fastener is desired on both sides. All metal fasteners are finished in brown enamel. Fastener has 1″ capacity prongs on one side of the divider and 5/8″ capacity on the other. The 1″ prongs are inserted through slits in the divider and folded back to provide fasteners on both sides. “TP” style fasteners are available installed on an MTO basis or as a separate stock item, TP-1L. Two single brass tangs are attached to folders using brass eyelets. Furnished on 2-3/4″ center-to-center unless otherwise specified, these 1-1/2″ capacity fasteners can be placed in other positions to accept papers punched at other dimensions. “T” style fasteners are available on an MTO basis only. Folders may be punched to facilitate installation of either installed fasteners or adhesive-backed fasteners. Two styles of punching are available in standard 2-3/4″ center-to-center. All hole punching is furnished on an MTO basis. Punch styles (shown left). Smead will manufacture folders, pockets, jackets and other products to your specifications. 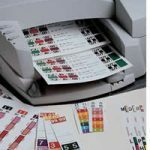 It is essential that we receive the correct information for MTO items to ensure that your order is produced correctly. Exact specifications must be clear and precise. Errors in dimensions, improper or inadequate information will cause unnecessary delays in production and shipment. The below illustrations show the method for measuring special-size items. Folders and jackets can be manufactured with single-ply or two-ply tabs in custom sizes or positions as MTO items. Detailed dimensions or drawings are required for accurate production to your specifications. Indicate tab positions as illustrated at right. Indicate the desired tab(s) using the positions shown to the left. Add the position number to stock numbers as a suffix. This is folder 155C. The “Z-” prefix indicates that the folders are MTO items. The “-3” suffix indicates that the 1/5-cut tabs are to be in the center (number three) position only. This is folder ET153L. The “Z-” prefix indicates that the folders are MTO items. The “33” indicates that the 1/3-cut tabs are to be in the third position only.